Where did you go so fast? My kids grew inches before my eyes. I have a kid in jr. high. Wasn't I just in jr. high? My baby's in kindergarten. She's not a baby. Wouldn't mind a baby, but it's not going to happen. Another year of the ponytail. Someday I'll win this fight. Some hard lessons were learned. Lot's of laughter, usually at Mike's expense. Nothing was more fun than watching the kids do what they love. Blessed in so many ways that we wouldn't normally think of as blessings. A lot of projects left undone. A lot more on my list of things to do. Grateful for friends in my life that make me smile and feel loved. Grateful for family that I take for granted. Grateful for a new year to try and do better, feel better about me, be nicer, more patient and loving. More sympathetic, not good at this one. A new year to look forward to. We rang in the new year at home pretty quitely except for the singing and dancing from Kristin and Michaela. They sang a rendition of Bleeding Love that had the dogs in the neighborhood howling. Mike made Cajun shrimp pasta and then we just ate way too many treats. After that there was a lot of boxing on the wii. Amy got into it a little too much. Reagen knocked Jeff out in round two. Nana supplied the firecrackers so we ended the night with a bang! Reagen got a cupcake maker for Christmas and we hadn't tried it out, so Monday night, while Dal and Kayla were at TKD, we had a little cupcake party. Honestly, at the rate that this thing kicks out cupcakes, you could starve before you have two made, but we still had a good time. I was in charge of washing all the parts, putting it together and reading the instructions. She was in charge of stirring, filling the cupcake liners, frosting, sprinkles, and licking the bowls clean. December was a crazy month, but I got to do quite a bit of something I love. Photos. No, my kids didn't make it into many pictures, but I wanted to post some of the families I shot. This is my cute friend Chelsea and her husband Chris. Chels loves to take pics, too so I'm going to get her to take some of my fam when it warms up. I think Reag was only one years old in the last family photo we have. Sad, huh? around so it's weird to have someone sit still when you get them where you want them. and I was lucky enough to get to visit and take some pictures. She has waited a long time for him and she's such a cute little mom. by the end they had blue lips and a little frostbite. My bro and sis-in-law's family. 4 kids and 12 grandkids...you have about 2 minutes until someone's crying or fighting over who gets to sit in the tree. LOL! Look at these cuties! Nathan and Kambree. 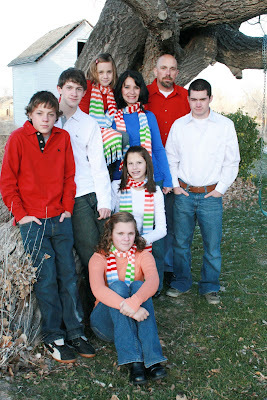 They braved the cold to have a couple pics snapped after the family wimped out and left. I can't believe it has come and gone. It snuck on me this year, maybe because it was warm right into the beginning of December. In 2009, I am going to start preparing in July, seriously. The house didn't get decorated, the yard didn't have lights, and I was shopping right up to the day. I had a lot of anxiety and next year I'm hoping to avoid that and enjoy the season more. The kids love Christmas and started out the excitement at Debbie's Christmas party on the 19th. Santa came to make sure everyone had been good. Dallon was a little questionable. He seems to be getting a little of that teen 'tude. Gabe was having a nap so he's not in the picture. re-enactment of the manger scene. The kids slept in until 8:00 Christmas morning. I guess keeping them up late all week paid off. We got a Wii for the family and the kids love it. It is a great workout. Reagen takes her shirt off to box. It is the funniest thing. They're driving the Mario Cart here. Not quite as physical, shirts required. Is this a happy Christmas morning face, or what? Reagen wanted Biscuit, the interactive dog that wags his tail and moves his head. I couldn't see paying $159 for Biscuit, when you can get Spots for $30. He doesn't make noise or wag his tail, but we have a cat that lives in the garage that does all that. Mike and Dal went to Las Vegas for the Pigskin Tournament over Thanksgiving. This is the fourth year to go, but the first year that we haven't all gone together. Me and the girls stayed here and had the traditional dinner with family, watched lots of movies, and ate lots of pizza and junk food...good times. I'm officially back on my daily fix of Mtn. Dew and I became a brunette. They were the ones in Vegas, but me and the girls were living the wild life. Anyway, they won their first game against San Diego and lost their second game by one point in overtime to Dallas. Here are a couple of pictures that a friend emailed me. The first picture is with Randall Cunningham and no, I have no idea who he is, but Mike said that he will be inducted into the hall of fame eventually. He also signed Dallon's football, something Dal can treasure for years to come or come home and immediately want to sell on Ebay. No action shots because the girl with the camera was home admiring her Mtn. Dew belly. The second picture is of the team. Dal is #12. On Saturday, Debbie had all of her grandkids and my kids over to make gingerbread houses. She has made this a fun tradition for the kids. They absolutely love it and they all make their own little masterpieces. Doesn't Michaela look so excited? Grammy Deb helping Landon...patience of Job. Little Lincoln was dressed for the occasion. Look at the grip on this girl. Braxton working on the shingles. I think Ky was sneaking a little frosting. The proof is on his cheek. Kaeson trying to figure out how to get the frosting on the house instead of his hands. I think Angie enjoyed this just as much as the kids. their houses and that has taken real will power.